Another idea posited during a water-cooler chat today was that, rather than an out-and-out reset in US posture, the biggest impact will come through countries adjusting their own attitudes in a bid to stay one step ahead of the nascent ‘Trumpism’. Behind the business-as-usual bustle among the SCCR faithful this morning there was optimism about real progress being possible on the Broadcasting Treaty (BCT) which, as reported here during SCCR 32, has descended into a game of diplomatic ping-pong that is acting as a brake on the wider SCCR project. The meeting was opened for the first time by Sylvie Forbin, the new Deputy Director General, Copyright and Creative Industries Sector. Many in the room are counting on Ms Forbin, an upbeat and focused French national, to break the standoff around the BCT that is so far the only outcome of almost two decades at the negotiating table. Shrewdly, Ms Forbin declared herself committed to finding ‘innovative and pragmatic solutions’ to the benefit of all stakeholders in both public and private sectors. She also asserted that a number of delegates were ready to move to a diplomatic conference on the BCT. A diplomatic conference would be a giant step towards the long-awaited consensus on the treaty text. SCCR day one has traditionally been consumed by lengthy Member State delegates’ statements focused on back-slapping the chairman, applauding WIPO’s vital work and pledging their total commitment to the multilateral process. The value of this custom — beyond momentarily giving the speaker the spotlight — is a well-kept secret. But to the relief of many this morning, committee chairman Martin Moscoso neatly sidestepped the ritual by inviting statements only from regional representatives. There are several of these, including the Asian-Pacific group; African; Latin-American and Caribbean (GRULAC); Central Europe and Balkan States (CEBS); Central Asian and East European; and Group B, the developed countries. This minuscule but canny modification enabled the chairman to sidestep the pointless diplomatic niceties and move straight to the first item of substance, the BCT. WIPO — like everyone else — has evidently grown waffle-weary and is doing all it can to make best use of the available time. Unquestionably, this approach should be rolled out to all multilateral fora. Joining the IPA at SCCR this week are our own president-elect, Michiel Kolman, and chair of the IPA Copyright Committee, Paul Doda; to my knowledge, this is the first time the IPA’s delegation has been so comprised. 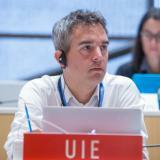 This reinforced IPA presence is part of the Association’s enhanced WIPO strategy; the SCCR is a unique bellwether of the way national governments view copyright and what their priorities are with regard to IP legislation in general. Finally, when the delegate from the USA made his first intervention it became clear that the transition to Trumpism would already play its part in the SCCR after all. It seems even the Americans are erring on the side of caution; they can have no idea what their orders will be until the new sheriff rides into town.